Cette étude explore le rituel de la cérémonie d’ouverture du Parlement dans le Londres victorien, au moment où la cérémonie revêt la forme qu’elle présente encore aujourd’hui. Cette modification du cérémonial a lieu en raison de la construction du nouvel emplacement où il est désormais effectué : le palais de Westminster. Nous étudierons la relation entre politique, histoire, architecture et rituel, dans la création de la démocratie parlementaire et de l’identité nationale du Royaume-Uni. Nous soutenons que le nouvel édifice du Parlement, symbole de la magnificence royale, surcompense l’autorité déclinante du souverain et encourage la redistribution des pouvoirs politiques, tout en évitant une guerre civile et en permettant de maintenir la tradition. Cette étude constitue une analyse du déroulement de l’entrée de la reine lors de la cérémonie d’ouverture, en détaillant les caractéristiques et l’iconographie des Chambres et en observant le déplacement de la procession. La cérémonie et le palais sont envisagés comme des constructions idéologiques qui influencent les structures politiques à travers un récit ritualisé, historique et fonctionnel. Finalement, cette analyse postule, et ce de manière originale, que l’architecture des nouvelles Chambres du Parlement a joué un rôle dans l’acception finale du concept de monarchie constitutionnelle en Angleterre. In Ritual and Response in Architecture, Quantrill argued that “ritual is the generator of plans which [then] generate the architectural form,”7 and emphasized the primacy of sacred acts through examples of ecclesiastical buildings. In this essay, I explore a somewhat different relationship between ritual and architecture. By studying the ritual of the Victorian State Opening of London’s Parliament as it took its shape due to the building of its new setting, I argue that the finally canonized ritual was generated by the new building as much as the building acknowledged the traditional ritual, and additionally, that both had a role to play in the prevailing configuration of the concept of the constitutional monarch. The decorous ceremony and the edifice are theorized as ideological constructs that influenced the political structure by means of narratives crafted by palpable, material realities with characteristic performative agencies. The diminishing religious character of the ceremony is hypothesized not as a secularization of the continuous Monarch, but rather as the fine-tuning of the legitimation of the Monarch’s political agency and responsibilities.8 Contrary to interpretations that recognize the opulent regal character of the building as a sign for the persisting dominance of the Sovereign during the mid and late nineteenth century, I argue that the new Parliament building, as a scene of royal magnificence, overcompensated for the Sovereign’s diminishing authority and aided the re-casting of political power relations while avoiding civil war and preserving tradition. With emphasis on the ritual’s setting, the study is conducted through an analysis of Queen Victoria’s sequence for the Opening of Parliament by detailing the chambers’ characteristics and iconography, and by observing the participants’ movements from the Royal Entrance in Victoria Tower to the Queen’s ascent to the throne in the House of Lords. It is against this roughly sketched political and historical context that the public architectural competition for the new Houses of Parliament was announced in 1836, according to which the new building was to be designed in either Gothic or Elizabethan style. The commission received 97 proposals and not without controversies, unanimously chose Charles Barry’s and Augustus Pugin’s design (see Fig. 1) in the Gothic style, meant to reflect the reformed nation and government. The construction of the new Houses of Parliament began in 1840. Fig. 1. Charles Barry, Elevation for the New Houses of Parliament, West Front, pen and ink, 1836. British Architectural Library, RIBA, London. Queen Victoria used the Victoria Tower Royal approach and full sequence for the first time at the Opening on February 3rd, 1852. The morning of the Opening, she departed Buckingham Palace in the Irish State Coach, escorted by the Household Cavalry, passed along the Mall, Whitehall, and Parliament Street, and arrived at Victoria Tower. At this point, the Victoria Tower was one of the tallest buildings in the world and apart from being the Royal approach, it was designed to store the archives of Parliament. This architectural arrangement interestingly positioned the Queen at the threshold of the Palace alongside history. The arches of the Tower were built wide enough to allow the Queen’s Coach to drive through at the State Openings. With the arrival of the Queen, the Royal Standard flag was raised at the top of the tower and the Sovereign’s presence was indicated. The Queen was greeted by the Great Officers of State, the Duke of Wellington, and the Usher of the Black Rod, among others. The procession then entered through the threshold on the north side of the Tower and arrived at the Landing Place. The Queen’s sequence went through noteworthy changes during the design stage (see Fig. 2). Initially Barry designed a more dominating royal staircase running parallel to the Houses’ longitudinal axes. However, as Alfred Barry reports in the biography of his father, the architect later hesitated and changed the position of the staircase to attain a generally more balanced ground plan. Following this modification, whether this alteration was essentially Barry’s initiative or was externally influenced, the Queen’s trajectory was reduced and saturated in a smaller portion of the plan. Fig. 2. Some of the changes the Queen’s sequence underwent as depicted by the physician and inventor David Boswell Reid (1805–1863) during the building of Parliament. The National Archives, Image Library, London. Fig. 3. 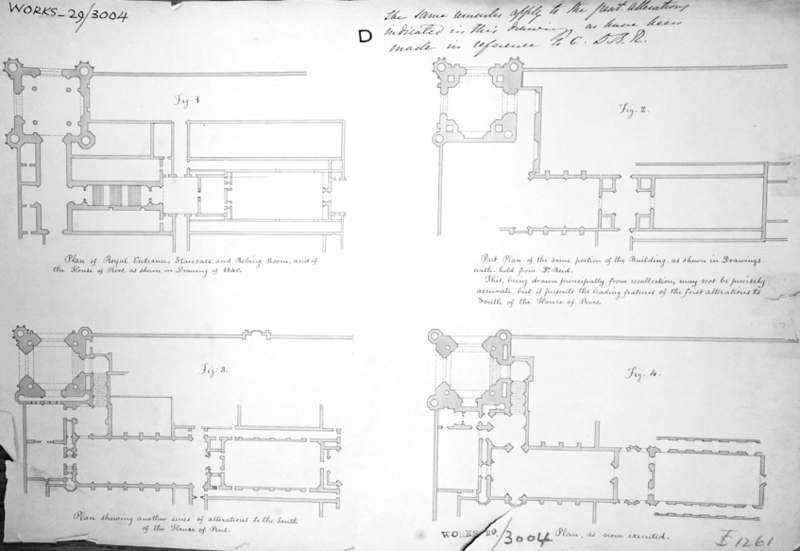 Ground Floor Plan of the Houses of Parliament indicating Queen Victoria’s sequence for the Opening of Parliament. Upon the Queen’s arrival at the Landing Place, the Royal Staircase would have been somewhat dark as natural light diffused through the stained-glass windows. Concurrently with the windows, all architectural elements sprouted vertically towards the ribbed-pointed arches and all formal presence provoked the Queen’s initial ascent. At the beginning of the procession, the broken line of the participant’s movement and the Gothic ambiance stirred an anachronistic atmosphere, which, I maintain, helped “disjoint” time as participants entered the independent time of the ceremony.21 Anachronisms, such as this one, played a role in historical constructions of continuity and were later thought to be imperative to Whig historiographers.22 However, the particular connection between the architecture and Whig’s politics is not the essay’s pressing concern and should be studied elsewhere. During the ascent up the Royal Staircase, the Norman Porch would have appeared as the point of appeasement and security, a resting place preceding the Robing room and the Queen’s transformation (see Fig. 3). The Norman Porch was envisioned as the overture for the Robing room and Royal Gallery. It was supposed to display sculptures of the Kings of the Norman Period, the first period in English history in which a Parliament was established.23 Although the sculptures have never been positioned there, the lavishly decorated room with its exquisite finery of detail, presented and still presents a magnificent image of that fragment of English history. By observing the sequence and its proposed bodily movement, it can be presumed that entering the Robing room was a detour to some extent - an additional stepping out. If stepping in the Houses of Parliament through the Landing Place, Royal Staircase, and the Norman Porch was stepping out of time and into a “historical time-travel,” then stepping into the Robing room can be interpreted as entering a realm of history entangled with mythology. This interpretation is supported by the character and decoration of the Robing room adorned with themes from the Arthurian Legend. Dyce envisioned a portrayal of the Legend free from ancient heresy, or any endorsement of Catholicism, and purified of immoral episodes.31 He proposed to paint seven frescos32 in which the Knights were personifications of certain moral qualities. By censoring the legend and promoting a governing system that embodied moral and social codes through universal values, Dyce managed to tailor the ideal of chivalry into supporting the modern conception of Monarchy. Namely, the theme of chivalry carried a partisan subtext while at the same time preserved its traditional aristocratic associations.33 Norbert Elias insightfully explored the role of chivalric stories, beginning with the knightly-feudal crusades and away from Latin Christendom, as one of “taming” the warrior and civilizing the aristocracy.34 In a similar manner, the English claimed the origins of chivalric stories, embedded them in contemporary context, and made use of them, once again, to further, or cement, the framing of court. To sum up, chivalry was recognized as a value that endured through varied states of human affairs as a mixed system of opinion, power, and sentiment, due to tradition and the principle of succession. It prevailed, according to Dyce, because of the universality of its inherent values and the principle of succession which followed tradition. In the realm of the transcendent principles, hierarchy, authority, brotherhood to the nation, noble equality, and liberty stood together in the pragmatically framed concept of freedom. What is made most explicit through the use of the Arthurian Legend in the Robing room is the Art Commission’s and the artist’s veneration of narrative presented simultaneously with the need to stabilize, or pin down, the narrative’s fluctuating nature. In this narratively constructed stern realm, the Monarch was to submit to social esteem, and authority was to yield to historical wisdom. In this realm, Queen Victoria was to transform into a constitutional Monarch, for in King Arthur’s domain there was no room for absolute Monarchs and the fierceness of pride and power.35 Transformed, crowned, and robed, Queen Victoria, or better said, the Monarch, proceeded towards the throne through the Royal Gallery. The Royal Gallery was in continuance to the previously observed stylistic shift. If in the Landing Place, Royal Staircase, and Norman Porch there was an unquestionable Gothic presence, in the Robing room and the Royal Gallery that is not the case. The flat roofs and the restrained structural detailing render these rooms as enclosures that allowed predominance to iconography and communication through associations. In other words, in these two rooms, various meanings sprung from the paintings and the sculptures cradled in a somewhat restrained Gothic interior. The artefacts positioned in these rooms were metonymies through which the assertions of power, history, and culture, took place. Together, and through the narrative they performed, the art works stood for extensions of the self-constructing identity the expanding United Kingdom of Great Britain and Ireland was putting on display. The Royal Gallery’s new position in the ceremonial sequence is particularly intriguing. Before the 1834 fire, the ritual, following the Sovereign’s sequence, went from the Royal entrance, through the Royal and Painted chamber to the Robing room from which the King, or Queen, would directly enter the House of Lords. This meant that during the procession inside the edifice, a majority of spectators was admiring the King, or Queen, prior to their “transformation” and robing, as they walked towards the Robing room. 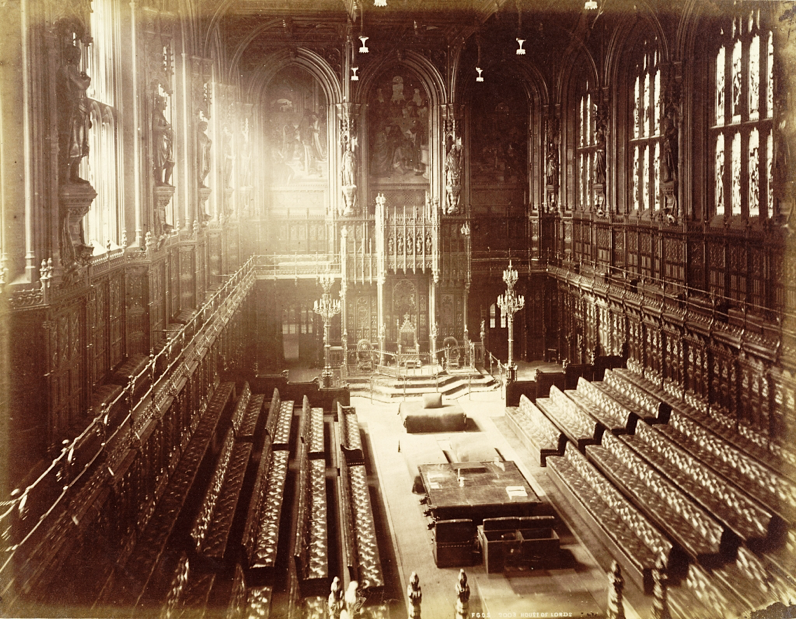 Differently, in the new Houses of Parliament, the Royal Gallery was positioned after the Robing room, which positioned the spectators as admirers of the representation of the Monarch and not the individual ruler. This repositioning of the spectators might have been a conscious political decision, or it might have ensued as a result of architectural planning concerns, nevertheless, it remains an intriguing outcome yet to be unraveled. The Royal Gallery’s thematic was historical with a focus on England’s military history. It had portraits of the Monarch throughout history, eight gilt Caen stone sculptures of rulers under whose guidance great battles have been won,36 two paintings by Daniel Maclise, and a copy of the Magna Carta. During the procession, Maclise’s painting that appeared to the left of the Monarch, was “The Death of Nelson Supported by Captain Hardy on the Victory at the Battle of Trafalgar,” and to the right his “The Meeting of Wellington and Blücher after Waterloo,” finished in 1861. When the Monarch passed through the Royal Gallery, she would already have been “transformed” and would not require further affirmation. To put it shortly, in the Royal Gallery, Queen Victoria did not need a historical narrative to help her represent the monarchy. In the Royal Gallery, it was the institution of the Monarch that needed shaping, affirmation, and reminders - it can be speculated that this might have been the reason for the repositioning of the Gallery with its spectators after the Robing Room. Firstly, the victories of England elaborated through images of past Monarchs and Lords, standing in battle together with the people, reaffirmed the principles of hierarchy and succession as victorious; for instance, the Battle of Waterloo served as an affirmation of the path England has chosen versus the path chosen by Napoléon.37 Secondly, the presence of the copy of the Magna Carta cautioned the Monarch while positioning Parliament as a powerful presence. Taken as a whole, the Royal Gallery had its own agency, an atmosphere loaded with English power and historical wisdom represented as to shape a constitutional monarch in transition - one that preserved tradition and embraced the reformed future. On the day of the Opening, the Royal Gallery would have been filled with spectators. The Monarch walked through the Gallery along a straight axis starting from the Robing room and culminating in the Prince’s Chamber38 at the sculpture of Queen Victoria. The Prince’s Chamber was richly decorated with royal images and heraldic devices from the Tudor period, also recognized as the Reformation period which emancipated England from the Catholic Church. The doors of the Prince’s Chamber were removed, and the Monarch could see the sculpture as an apex preceding the House of Lords.39 The marble sculpture of Queen Victoria in the Prince’s Chamber is by John Gibson and was finished in 1855. The sculpture represents Queen Victoria supported (or framed) on both sides by the figures of Justice and Clemency—standing reminders of her royal duties. She is portrayed sitting on a throne, wearing the George IV State Diadem, officially the Diamond Diadem, and not the Imperial Crown. In her left hand, she holds a scepter and in her right, a laurel wreath.40 Traditionally, the Queen, or King, would be portrayed holding a scepter and an orb mounted with a cross—the globus cruciger.41 The orb stood for ruling and was a religious symbol, and the scepter (most likely derived from the shepherd’s staff) symbolized governing. Together, both showed the Monarch ruled and governed. The role of the Monarch, in a constitutional Monarchy, was mainly thought of as one of governing and not ruling. The Monarch in that sense had the right to be consulted, to encourage, and to warn. Simultaneously, the sculpture being Queen Victoria’s portrait is also a “re-representation” of an absent figure. Thus, such a portrait can be interpreted, in the words of Louis Marin, as a “memorial of history that is presence itself, that defines the place and time of the absolute present,”42 and as a “sacramental body that would at once operate the political body of the kingdom in the historical body and lift the historical body up into the political body.”43 Being reminded of the duties of the Monarch, Queen Victoria proceeded towards the House of Lords through the door on the east side of the Throne. The decoration and interior of the House of Lords is mostly the work of Augustus Welby Northmore Pugin (1812–1852), the strongest supporter of the Gothic Revival. For Pugin it was not enough that Gothic stood for “Englishness,” nor it would have been any different if it stood for the state, the people, or the Sovereign. According to Pugin, any architectural style communicated certain virtues which transcended the individual and present, and the Decorated, or Middle Pointed Gothic represented the most valuable Christian virtues. In Pugin’s persuasions we find a “synthesis of the real and the symbolic”44 which buttressed the image of the Gothic with an agency that seemed to surpass the political sphere from within the Houses of Parliament. Thus, richly decorated, with every detail thoroughly thought over, a dominating Royal Throne, and eighteen statues of the Magna Carta signatories45, the House of Lords (see Fig. 4) communicated meaning both through its direct affective visceral qualities and by way of reflection and associations. In this context, the Monarch, devised out of the ritual itself, as a concept and an idea, sitting as simply one of the three foundational parts of Parliament (the other two being the House of Lords and the House of Commons), uncovered the essential structure which unified the constitution and nation. In this instant, the three foundational parts of Parliament, tradition, and history, together with the view towards the future, emerged along the physical axis of the Palace of Westminster, which also connected the Houses and the Royal sequence. The Queen read her speech, written for her by the government, and Parliament was officially opened. The principle of succession was justified through the idea of English intrinsic rationality, and hierarchy reconciled with freedom;46 the ceremony accented mutual political interdependence that supported unity as a remedy for civil war, recast the Sovereign, and served as a reaffirmation for an expanding empire. The ceremony of the Opening of Parliament represented a stepping out of nineteenth century London into a historical, aestheticized framing of the nation’s image. From the Middle Ages onwards, in this ritual, the King, or Queen, represented an embodiment of divine presence and with it the Sovereign’s unquestionable inherent political power. For instance, at the Opening in 1536, Henry VIII and the Lords rode from York Palace to the Houses of Parliament, where the King put on his ceremonial robes and the Imperial Crown. Together with his procession, that included abbots and bishops, the Monarch proceeded to Westminster Abbey for the mass of the Holy Ghost. Upon the Monarch’s arrival at the abbey, an appointed abbot took the Monarch’s sceptre—his representation of authority not needed before God. After mass, the Monarch went back to the Houses of Parliament where the Lord Chancellor delivered a “worshipful sermon,”47 after which the royal speech was read and Parliament officially opened. Contrary, as shown, in the Victorian era the nature of this ritual was primarily secular - there was no attending mass, the procession did not include representatives of religious orders, and there was no sermon before the reading of the royal speech. However, the Monarch was still there by divine right. It can be speculated that what was being crystallized was the move within the concept of governing institutions away from having the Church as their sole gravitational center and if not supplanting the Church, then at least intensely supplementing it with the concept of the nation. Additionally, it can be speculated that within the new Houses of Parliament, it was the history of the nation that was being presented as sacred and that history was understood to be foundational to the progressive process of constructing the liberal democratic nation. Thus, the ritual of the Opening was used to accommodate the necessary shift while the “cultural habitus”48 remained strong. This presents an intriguing idea that rituals, while working in the frameworks of established narratives, can be used to foster innovation and re-invent traditions.49 The annual ritual of the Opening of Parliament continued to inaugurate the Sovereign for the sake of tradition and the nation, and it continues to do so today in the same shape, following the same acts (even though some meanings have changed50) finally modeled in the beginning of the nineteenth century with the building of the new Houses of Parliament. By studying and surveying religious buildings and their respective rituals throughout history (from a Zen monastery in Kyoto to Le Corbusier’s Ronchamp), Thomas Barrie has argued that human built settings are not primarily empty vessels in a more-or-less empty space. Rather, according to Barrie, buildings and their sites are designed and built as both instruments and aims of specific human actions meant to provide meaning and structure to a given culture. Similarly to my inferences regarding the ritual at the Houses of Parliament, this statement establishes a strong dependency between the character and the aim of a built structure and its physicality. See Thomas Barrie, Spiritual Path, Sacred Place: Myth, Ritual, and Meaning in Architecture, Boston, Shambhala Publications INC., 1996, p. 74. Henry S. Cobb, “The Staging of Ceremonies of State in the House of Lords,” in The Houses of Parliament, London, Merrell Publishers Limited, 2000, p. 31. It might be of interest to note that the Royal Coronation ceremony went through a similar re-invention with Queen Victoria’s Coronation, which took place on the 28th June 1838 (over a year after she succeeded to the throne). Some of the ritual adjustments that have been followed in subsequent coronations were: for the first time, the procession begun at Buckingham Palace—the new Royal London residence, and the road route to Westminster Abbey was extended to allow for more spectators, among other regulations. Malcolm Quantrill, Ritual and Response in Architecture, London, Lund Humphries Publishers Limited, 1974, p. 14. Bernhard Jussen has argued that higher degrees of political secular institutionalization do not decrease, but increase ritualization. See Bernhard Jussen, “The King’s Two Bodies Today,” Representations, vol. 106, no. 1, Berkeley, University of California Press, 2009, p. 102-117. Designations such as “the modern appreciation of the concept of nation” are delicate and somewhat problematic especially due to the polyvalent disposition of the term modern. In the context of this essay, “the modern appreciation of the concept of nation” alludes to the nation state during the nineteenth century as it received its systematic shape by adjusting its religious and secular ideological stances and thus, its institutional and administrative establishments. See Eric J. Hobsbawm, Nations and Nationalism since 1780: Programme, myth, reality, Cambridge, Cambridge University Press, 1990, p. 80-100. The Magna Carta is a document intendedto pacify a group of rebels barons. It promised, for the barons, the protection of church rights, protection from illegal imprisonment, access to swift justice, and limitations on feudal payments to the Crown. Neither side respected the commitment, which lead to the First Barons’ War. However, it is considered the first limitation to the power of the Sovereign. The Magna Carta was signed by King John on June 15th, 1215. Lewis B. Namier, Monarchy and the Party System, Oxford, Oxford University Press, 1952, p. 26. David Cannadine, “The Palace of Westminster as the Palace of Varieties,” in The Houses of Parliament, Edited by Iain Ross, London, Merrell Publishers Limited, 2000, p. 19. In his Reflections on the Revolution in France, Edmund Burke uses the term England when referring to the ruling dynasty of England, the “Glorious Revolution” of 1688, the people of England, etc., and uses the term Great Britain when referring to the King of Great Britain, the constitution of Great Britain, and matters related to India and the Americas. Edmund Burke, Reflections on the Revolution in France, , London, J. M. Dent & Sons Ltd., 1951, p. 29. The most evident example for such an architect is Augustus Welby Northmore Pugin (1812-1852). In his Contrast published in 1836, Pugin contrasted, through illustrative plates, a building from early nineteenth-century with its typological fifteenth-century equivalent, and thus, argued for the significance and moral supremacy of the Gothic Style for his own contemporary London. A different illustration comes from John Ruskin who wrote about the Gothic revival diverging from Pugin. See John Ruskin, The Seven Lamps of Architecture, New York, John Wiley, 1854. See Martin Bressani, “Revivalism,” in Companions to the History of ArchitectureVolume 3, New Jersey, Wiley-Blackwell, 2017. Through the examples of John Soane and Karl Friedrich Schinkel, Martin Bressani and Christina Contandriopoulos have argued that architects in the early nineteenth-century had an “unrestrained ambition to reshape their respective nations architecturally” and that they understood “the notion that a sense of place and a people’s identity is embodied in architectural artefacts.” Furthermore, they write that “the concept of a ‘national’ or ‘regional’ tradition emerged as one of the new means through which architecture could regain political agency.” See Martin Bressani and Christina Contandriopoulos, “Introduction: Nineteenth-century Architecture,” in Companions to the History of ArchitectureVolume 3, New Jersey, Wiley-Blackwell, 2017. Michael J. Lewis, The Gothic Revival, London and New York, Thames & Hudson Ltd., 2002, p. 72. Hans-Georg Gadamer has argued that “the mystery of festive celebrations lies in their suspension of and from time.” See Hans-Georg Gadamer, The Relevance of the Beautiful, London, Cambridge University Press, 1986. P.B.M. Blaas, Continuity and Anachronism: Parliamentary and Constitutional Development in Whig Historiography and in the Anti-Whig Reaction Between 1890 and 1930 , New York, Springer, 2013. The Norman Period (1066–1154) followed the eleventh century invasion and occupation of England by an army of Norman, Breton, and French soldiers led by Duke William II of Normandy, later known as William the Conqueror. William I was the first English King to form a Parliament. The Parliament had the right to advise the King at times he felt he needed advice; the King was still of absolute power and divine right. The Imperial Crown was rarely worn by the Monarch, mainly the Monarch would wear it on leaving Westminster Abbey at the end of his, or her coronation ceremony and at the State Opening of Parliament. Following the abolition of the monarchy and the execution of Charles I in 1649, the Tudor Crown was broken and sold. The Crown that Queen Victoria wore was made especially for her in 1838. See Ernst H. Kantorowicz, “The Crown as Fiction,” in The King’s Two Bodies: A Study in Mediaeval Political Theology, New Jersey, Princeton University Press, 1997, p. 347-383. Burke, 1951 , p. 26. After the building had started, attention was turned to the interior decoration and a Fine Arts Commission was appointed in 1841 to oversee the project. The Commissioners were keen on fostering a national school of historical painting, and the project mobilized the artist community in a state-funded art project. The committee members included: Prince Albert, Sir Charles Lock Eastlake, Sir Robert Peel, The Viscount Melbourne and Charles Barry, amongst others. According to Dyce’s son, Dyce spoke with Prince Albert at Osborne, where Dyce was spending the summer, and he “suggested to his Royal Highness, while conversing about German art, that the stories of King Arthur, and in particular Sir Thomas Malory’s Morte D’Arthur, would supply to English artists subjects of legendary history, which, for their great interest, their antiquity, and national chivalric character, would surpass those of the “Niebelungen-lied,” of which so much had been made by the Germans.” Art Journal, LXX, 1860, p. 296. Dyce also felt he is not the best choice for the task and suggested the commission be given to Daniel Maclise who was already established as a painter of chivalric themes. If Maclise had the reputation of being a charming Irish libertine, Dyce had the reputation of uncompromising acuteness and austerity. Prince Albert may have felt that in Dyce’s hands the Queen’s Robing room would be safer. Apart from Malory’s Le Morte D’Arthur (1485) which was his textbook, he consulted two popular historical texts: Algernon Herbert’s Britannia After the Romans (1836) and Edward Davies’ The Mythology and the Rites of the British Druids (1809), which were works that inquired into Arthur’s historicity. Christine Poulson, The Quest for the Grail, Arthurian Legend in British Art 1840-1920, Manchester, Manchester University Press, 1999, p. 26. For an example, when Dyce portrayed Gwenevir, he chose to show her right after the wedding to Arthur as a virgin bride (he did not alter the legend in order to portray her innocent after the infidelity with Launcelot); in Hospitality (which takes place after the infidelity) she is marginalised. The frescos that depict: hospitality, mercy, courtesy, religion, and generosity were finished, but due to Dyce’s untimely death (1864), fidelity and courage were never completed. Debra N. Mancoff, “Myth and Monarchy: Chivalric Legends for the Victorian Age,” in The Houses of Parliament, London, Merrell Publishers Limited, 2000, p. 243. Norbert Elias, “The history of the concept of ‘civilité’” in On the Process of Civilization, trans. Edmund Jephcott, Dublin, University College Dublin Press, 2012, p. 61. Burke, 1951 , p. 74. The eight gilt Caen sculptures were made by John Birnie Philip and are placed framing the niches of the doors and window of the Royal Gallery. At the south door: Henry V and Elizabeth, at the north door: Alfred and William I, at the west door: William III and Queen Anne, and at the bay window:Richard I and Edward III. The defeat at Waterloo (June 18th, 1815) ended Napoléon's rule as Emperor of the French, and marked the end of his Hundred Days return from exile.Napoléon abdicated 4 days later, and on July 7th, 1815 coalition forces entered Paris. 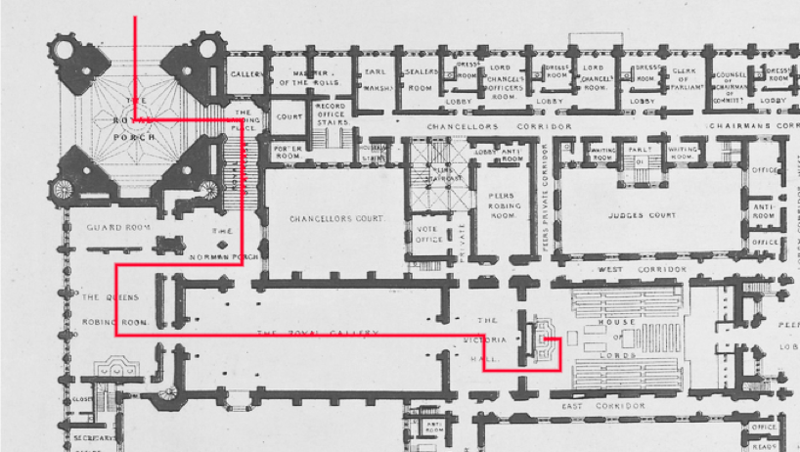 Initially, as can be seen in the plan, the Prince’s Chamber was named Victoria Hall. Owing to the Queen’s insistence on the Prince’s official presence in the newly constructed building, the room was renamed into the Prince’s Chamber. Moreover, due to Queen Victoria’s demands, after a brief dispute, Prince Albert gained the right to ride in the Queen’s carriage to Parliament on the day of the Opening and had a chair designed exclusively for him in order to sit next to the Queen in the House of Lords during the ceremony. Benedict Read, “Sculpture and the New Palace of Westminster,” in The Houses of Parliament, London, Merrell Publishers Limited, 2000, p. 253. The Laurus nobilis symbolised victory. The expression “look to one’s laurel” meant taking care of your victories in order not to lose rank to competition. The Globus cruciger symbolised the Christian God’s dominion over the world. The Queen, or King, would hold the world in her, or his, hand to show that she, or he, ruled on God’s behalf. The surmounting of the Orb (much older symbol of the world) showed the triumph of Christianity. Louis Marin, Portrait of the King, translated by Martha M. Houle, Minneapolis, University of Minnesota Press, 1988, p. 209. Chris Brooks, Signs of the Times, London, George Allen & Unwin, 1984, p. 149. Catherine Edith Bell has argued that the precise function of ritual is to mitigate between irreconcilable poles. See Catherine Edith Bell, Ritual Theory, Ritual Practice, New York and Oxford, Oxford University Press, 1992. Henry S. Cobb, “The Staging of Ceremonies of State in the House of Lords,” in The Houses of Parliament, London, Merrell Publishers Limited, 2000, p. 32. Coming from social theory the phrase “cultural habitus” is usually identified as Pierre Bourdieu’s term for the physical embodiment of cultural capital (which he further unraveled in three forms: embodied, objectified, and institutionalized). See Bridget Fowler, Pierre Bourdieu and Cultural Theory, London, SAGE Publications Ltd., 1997. See Eric Hobsbawm and Terence Ranger (ed. ), The Invention of Tradition, Cambridge, Cambridge University Press, 2003. Dijana is a PhD candidate at the School of Architecture at McGill University. Her research focuses on the theoretical aspects of Michelangelo Buonarroti’s architectural opus, which she explores through the study of the master’s drawings. She is a recipient of the Schulich Fellowship and the McGill Engineering International Doctor Award. Additional interests include architecture’s agency and performative capacities, for instance when coupled with ritual practices, and the concept of atmospheres as medium - seeking to understand how it theoretically amplifies architectural studies.